- Publisher Read the compelling testimonies of today's psalmists, musicians, and poets. Share their stories with friends and fellow worshipers. Sing twenty five of your favorite praise songs and choruses, with a new understanding of the insights, pain, and devotion that helped birth each extraordinary one. This three step challenge was first embraced by worship pastors through the popular "Song Stories" column in Worship Leader magazine. Now adapted and expanded with all new material for this collection, these stories invite you, the worshiper, to meet firsthand the songwriters who God used to touch your life, and to learn the often unexpected ways God has encountered them in life and song. *Meet one woman who, in her depression, felt she had nothing to offer God, until "I Love You, Lord" slipped from her brokenness. *See how one man's interpretation of Isaiah 52 was rejected by nearly every publisher before "Our God Reigns" became the anthem for an international movement. *Learn how, despite being forced to choose between her husband and Jesus, one woman found the strength and inspiration to write "He Has Made Me Glad." CD inlcudes 25 praise and worhsip songs. Read how God has touched hearts through the lyrics and music of "As the Deer," "Holy Ground," "Lord I Lift Your Name On High," "I Love To Love You," and other contemporary praise and worship favorites. - Publisher What prompted the writers of popular worship choruses to write lyrics that would come to touch the heart of believers around the world? The unique insights and inspirations of Kregel Publications' best-selling "stories behind our great Christian songs" series now extends to include today's praise songs. Book comes with stereo CD featuring each song." 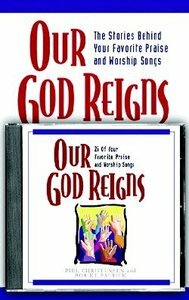 About "Our God Reigns (Book & Cd)"
Read the compelling testimonies of today's psalmists, musicians, and poets. Share their stories with friends and fellow worshipers. Sing twenty five of your favorite praise songs and choruses, with a new understanding of the insights, pain, and devotion that helped birth each extraordinary one. This three step challenge was first embraced by worship pastors through the popular "Song Stories" column in Worship Leader magazine. Now adapted and expanded with all new material for this collection, these stories invite you, the worshiper, to meet firsthand the songwriters who God used to touch your life, and to learn the often unexpected ways God has encountered them in life and song. *Meet one woman who, in her depression, felt she had nothing to offer God, until "I Love You, Lord" slipped from her brokenness. *See how one man's interpretation of Isaiah 52 was rejected by nearly every publisher before "Our God Reigns" became the anthem for an international movement. *Learn how, despite being forced to choose between her husband and Jesus, one woman found the strength and inspiration to write "He Has Made Me Glad." CD inlcudes 25 praise and worhsip songs. Read how God has touched hearts through the lyrics and music of "As the Deer," "Holy Ground," "Lord I Lift Your Name On High," "I Love To Love You," and other contemporary praise and worship favorites. What prompted the writers of popular worship choruses to write lyrics that would come to touch the heart of believers around the world? The unique insights and inspirations of Kregel Publications' best-selling "stories behind our great Christian songs" series now extends to include today's praise songs. Book comes with stereo CD featuring each song." A veteran worship leader, Phil Christensen wrote the popular "Song Stories" column for Worship Leader magazine for many years. He is currently serving as the worship pastor at Cedar Hills Evangelical Free Church in Cedar Rapids, Iowa.